Do I write this in first or third person removed? I had a writing gig once that required the whole thing to be written in second person with one remove. That was -odd-. Ah, hell, I’m not so good at third person when talking to people. It makes me feel pretensious. Third person has it’s place, but you came here to find me, so talking like ‘Dan likes chocolate and coffee, but while cats’ find him irresistable, he detests having their butts waved in his face’ is just wierd. While I’d love to say there’s something special that makes me a writer, and my therapist would like agree, the truth is that I talk to myself, like all the time, which is fine because in the real world I’m a bookkeeper of sorts, talking to one’s self is a requirement of the job. In short, and in order of priority, I am a husband, a father of six, an accountant, and mostly in posession of my write mind (see what I did there?). To elaborate, at mid forties, I have a great life happening, and I spend my days trying to keep the bills paid, while sneaking writing time into the margins because that’s what my life is. I’m not sure what you might want to know, so please, just email me if you have questions, and I’ll see if I can answer them. 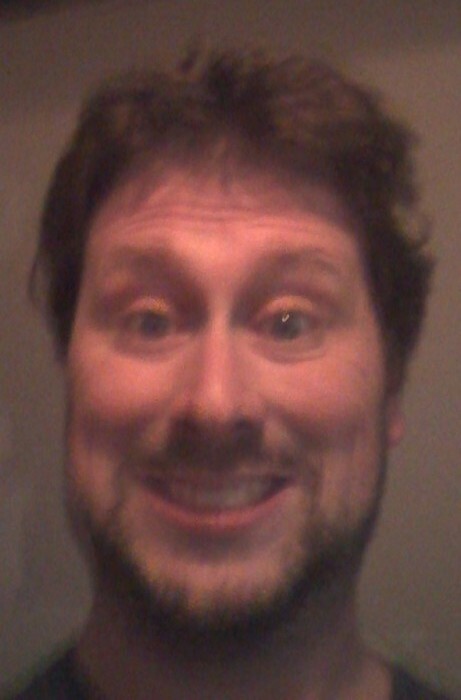 Here’s a recent picture of me, please note the awesome hair and the crappy photo skills. Dan.